Saturday, March 30, 2019 the Bass Pro Shops Team Tour held its first tournament of the regular season. Launching from Paris Landing on Kentucky Lake located in Buchanan, TN. Fifty-two teams went to battle in windy weather conditions to try and win the 2019 Triton 17TX powered by a 60HP Mercury four-stroke with Garmin Echo-map plus 93SV valued at 20K. 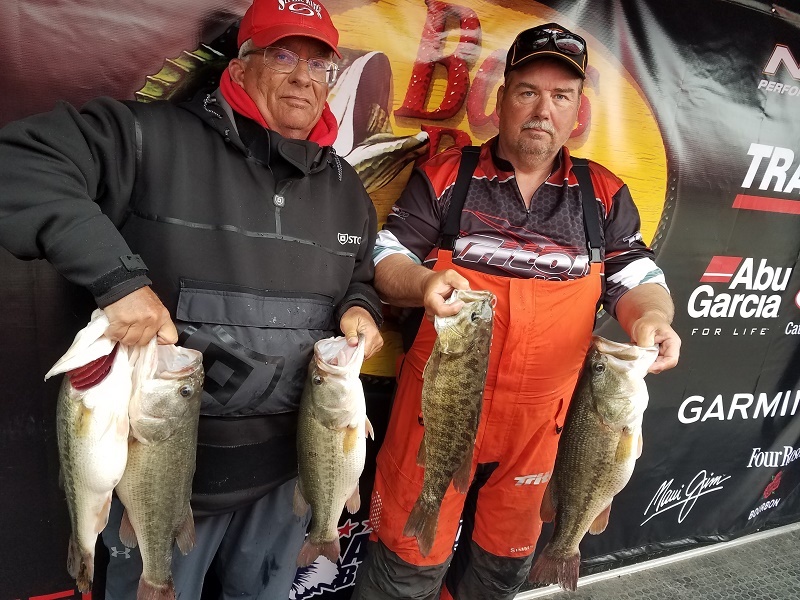 With just under a 2-pound lead over 2nd place Gary Singleton and Edward Gettys took the victory weighing in 5 fish for a total weight of 27.30-pounds. The team also earned a check for $750 for taking 1st place in the High Stakes Option Pot. “We went south about 20 miles and we were fishing in creek channels. We caught them on Spinnerbait, Crankbait, and Swimbait. We were sitting 13 to 15 feet of water throwing in about 7 foot of water,” said Singleton. Second place team Shawn Penn and Billy Schroeder brought 5-fish to the scales weighing 25.53 pounds. They earned a check for $2000.00 for their catch. They also earned a check for $550.00 from the High Stakes Option Pot. “We caught our fish north of the bridge. We caught our fish on small crankbait and a Spinnerbait. We caught them in about 2 to 5 foot of water.” said Schroeder. Coming in 3rd place was the team of Stanley Tucker and Ken Sheets bringing 5-fish to the scales weighing 22.02 pounds. They earned a check for $1300.00 for their 5 bass. “We caught most of our fish on a Spinnerbait. We made a pretty good run down south. We caught them on 2 banks and caught an almost 7-pound bass there.” said Sheets. Finishing 4th was the team of Adam Craig and Joshua Burton weighing in 5-fish at 18.60-lbs. Earning a check for $1000.00 for their efforts. Rounding out the top 5 was the team of Kevin Meunier and Kenneth Heckel weighing in 5-fish for 18.39-lbs. They earned a check for $800.00 for the work they put in. The next Tennessee Kentucky Bass Pro Shops Team Tour Tournament is on Old Hickory at Flippers Ramp on April 27th. About American Bass Anglers – American Bass Anglers is committed to providing low cost, close to home tournaments for the weekend angler while offering an upward path for individual angler progression. For more information about American Bass Anglers and all their bass tournament trails visit www.americanbassanglers.com. American Bass Anglers is sponsored by: Bass Pro Shops, Triton Boats, Mercury Marine, Nitro Boats, Tracker Boats, MotorGuide, Garmin, T-H Marine, Abu Garcia, Berkley, Engel Coolers, Four Roses Bourbon, Lucas Oil, Maui Jim, Optima Batteries and Power-Pole. Mailing address: American Bass Anglers, Inc, PO Box 475, Athens, AL 35612 PH (256) 232-0406.